Oh, Greece. So dreamy. So beautiful. So welcoming and friendly. 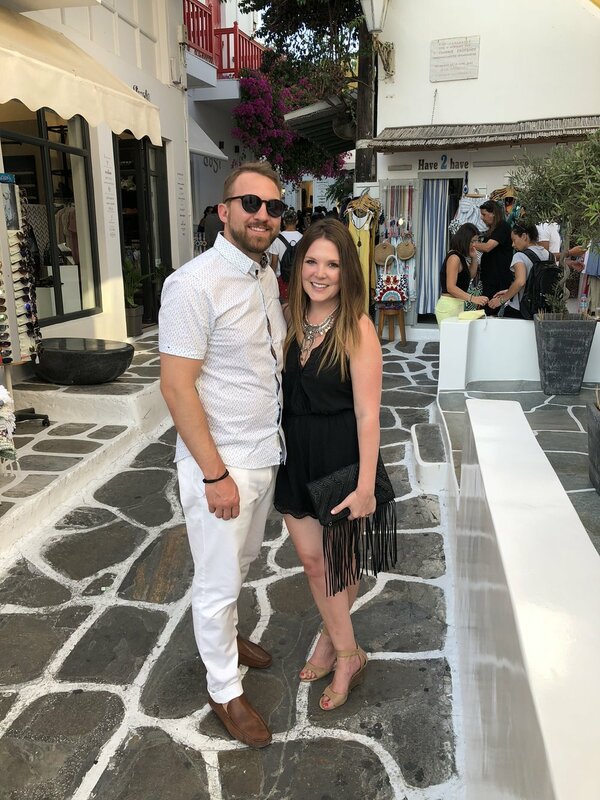 My first trip to Greece was truly amazing, so I wanted to share some of the highlights from the trip! Also check out Packing Essentials: Greece. We were invited by some friends to join them on their trip to Greece this past summer. Lucky us! We obviously couldn’t refuse an excuse to check Greece off of our travel list - and do it along with some of our besties. So we said YES and plans moved quickly from there. I normally would have been planning our itinerary for months leading up to the trip, but they had done a substantial amount of the planning by the time we were on board and we were somewhat along for the ride :) No complaints! We stopped in Athens before heading to the Cyclades Islands. We ended up visiting Kea, Kythnos, Siros, Dilos, and Mykonos. You can read more about all of the islands we visited on my Guide to the Cyclades (coming soon!). In the meantime, I wanted to focus on Mykonos. Because man, did it exceed my expectations! I had a few presumptions about Mykonos. I knew it was a party scene. I knew it was frequented by tourists. I knew it was sometimes ranked secondary to Santorini. But I also knew it would be gorgeous and I knew we would have a glimpse of those windmills I kept seeing all over Instagram. That was about it! I had no clue what to expect in terms of food and no idea what else the island had to offer aside from about 50 bars! First and foremost I want to stress that Greece is extremely safe! And Mykonos is no different. I travel a lot and have been to some cities where you have to be more cautious (clutch your purse a bit tighter, not indulge in that second glass of wine so you can be alert, etc.). Mykonos was not at all like this! I felt very comfortable there from the moment we set foot on the island. The locals are friendly and most people speak a bit of English, so it is very easy to navigate. Another thing we never worried about was having cash. Mykonos is developed - most places take credit cards or use the Square app. The streets are filled with people shopping, eating, and enjoying themselves - day or night - so we never felt alone or too isolated. You have nothing to worry about when visiting this island, except how you are ever going to peel yourself away to leave! There are plenty of options for getting around Mykonos. The first and best option is to walk! We spent most of our time on the island walking around, taking in the sights, and ducking into shops and restaurants. The second best option is to rent a four wheeler or a moped - which we also did. You drive these on the main roads and it is thrilling! It’s a great way to see more of the island than you would get to see if you were walking or taking a cab. The rental companies will give you a map and suggest some great look-out spots to park and take photos. We ended up riding to the windmills, an olive oil shop, the top of the island for some photos, and then back down to the base for a quick swim at a local beach. We did all of this in about 3 hours time. I highly recommend it! Plus, since we were traveling with other friends, it was a nice way to get some alone time - just the two of us! The third option is to take a cab. There are cabs everywhere on the island so you won’t have a tough time finding one. Or have your hotel call one for you, if you are worried about making a reservation. No matter what you choose, you won’t have a problem getting around the island. Renting a four wheeler was the best decision! I saw mixed reviews about the food in Mykonos (and Greece in general) so I wasn’t sure what to expect. But I am here to tell you that every single thing we ate was delicious! In Mykonos, specifically, the town caters to the tourists. You will find something for everyone, every palette, from italian food, to street gyros, to burgers and french fries. You will not go hungry. I, however, fell in love with the Greek food and ordered a basic salad and fried cheese (saganaki) at almost every restaurant we went. Greece is also known for it’s seafood selection - if you like seafood, order the lobster pasta. It will blow your mind! I was particularly loving the way Greece does Greek salads because it is not how we do them in the US - they chop up fresh tomatoes, onion, olives, and green peppers. There is no lettuce! And the dressing is typically some olive oil, salt, and pepper. But it tastes amazing. Especially in the hot island heat I found it very refreshing and I try to duplicate it at home now. The salads are so good! Fresh peppers, onions, tomatoes, and whatever else they offer. Fried cheese called saganaki is mouthwatering..
Fresh pasta display / there truly is a wide variety of food on the island! 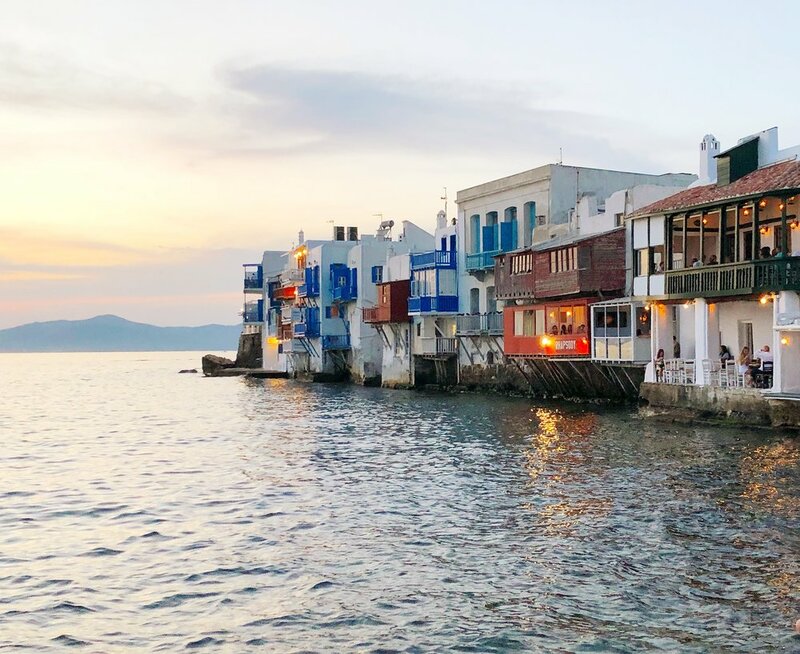 There are a ton of things to do in Mykonos. From day to night, you can fill your entire day with activities. As I mentioned, we rented a four wheeler to explore the island for a few hours. Then we spent some time at the beach before heading to dinner in the Little Venice neighborhood to catch sunset. Word to the wise: research what time the sun sets and plan to be at a table with a view (and a glass of wine) to take it all in. You won’t want to miss the sunsets on the islands - they are killer! Plus, the tables tend to book up right around that time, so grab a seat and an appetizer at least 30 minutes before, to ensure you’ll have a great spot to watch. Find yourself a table with a view and settle in for sunset. The Little Venice neighborhood in Mykonos - can’t beat that view! You’ll also want to check out the windmills (you know, that cluster of windmills you’ve seen one hundred photos of on Pinterest and Instagram!). They really are pretty - and they sit on the top of the island, so you get a great view of Mykonos! The windmills are located just past Little Venice neighborhood. You’ll be able to see them from there and walk to the top of the hill. The shopping experience on the island is one-of-a-kind. The shops stay open until all hours of the night, it seems. There are designer shops, places to get local hand-made goods, leather sandal stores, gelato parlors, and everything you can imagine! I picked up some local olive oil, olives, an evil eye bracelet, and an ornament with the windmills on it (this is a tradition I have). My girl friend picked up some fabulous leather sandals, some cute clothes, and more…you really could shop all day, if that is what you like! Plus, the cobblestone streets filled with trees and greenery really just add to the magical scene. I felt like we were in a fairytale! Shopping along these streets is really a dream! 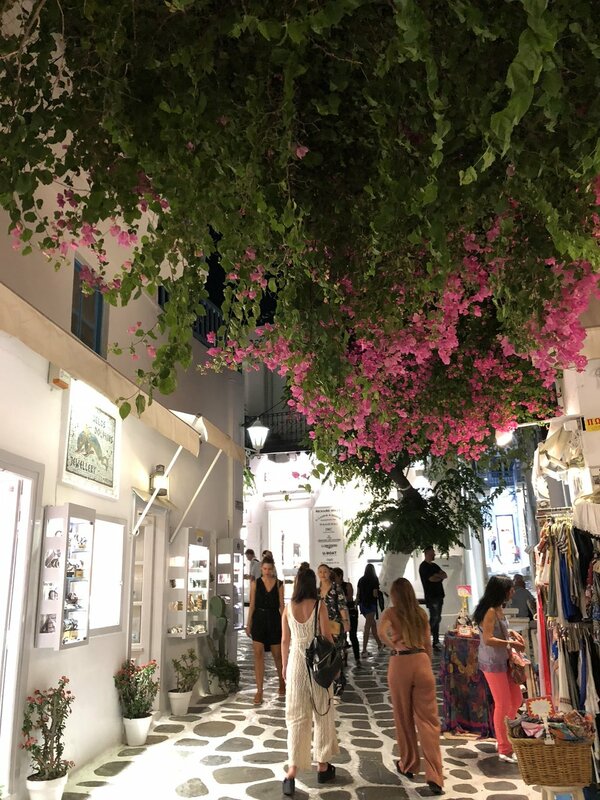 Mykonos has a great night life, as you’ve probably read. It does not disappoint! The bars and clubs line the tiny streets of Little Venice and you can duck into whichever one tickles your fancy, have a drink, then move onto the next one! It really is enjoyable. Everyone is out and about, talking and laughing. Dancing and drinking. It is peak vacation! Some clubs have a dress code (no sandals for women or no shorts for men). Women - I’d stick to wedges and a sundress or romper, just to be safe. Men - wear a collared shirt or some linen pants. Again, most places won’t care - it’s vacation! - but some of the clubs are a “scene” and I’d hate for you to be unprepared. Check their website or call ahead to see about dress code. Get the caffeine ready. The clubs stay open until 3:00, 4:00, and even 5:00am! We managed to stay out until 3:00am (we only had 1 night on the island, so we downed some espresso and went for it). Between hopping into the different clubs and dancing the night away, you will be shocked how quickly it goes from 11:00 in the evening to the wee hours of the morning. We had a great time dancing at the Skandinavian Disco Bar (pictured below) - a famous club on the island. We had just as much fun finding the small, local spots and crowding around a table with a glass of wine. Another tip: the little cobblestone streets are winding. And not marked that well. You will get lost. But you will find your way back. The streets are short and all of the bars look alike. Stay with your group and you’ll be fine. It is honestly part of the fun! Just soak in the view from each spot you go in, because you probably won’t be able to find your way back to it later. Oh and the local liquor is called Ouzo. Warning: it tastes like black licorice, so if that isn’t your thing, you probably won’t like it, but it is worth a try to say you did! Overall, the night life was a great experience and was worth the bags under our eyes the next day. Just before the sun went down, gearing up for our night out! Skandinavian Bar - one of the most popular nightclubs on the island. So are you ready to plan your trip to Mykonos yet? Thanks for reading along. I loved reliving how amazing our trip was and I hope you enjoyed the photos. Now that I am thinking about it, where to next?….